Hello everyone! 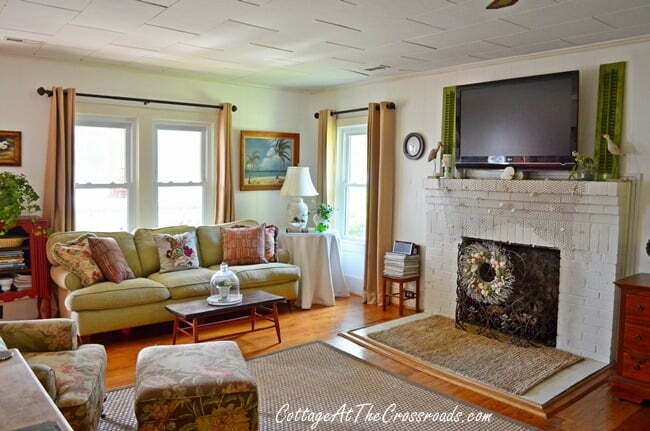 I'm Jane from Cottage at the Crossroads, and I am so delighted to share my favorite room with you today. 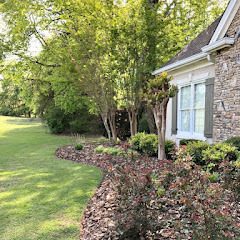 I was simply thrilled when Kim asked me to do so because Savvy Southern Style was one of the very first blogs I started reading about 4 years ago. And I still look forward to seeing what she's up to daily. I've had the pleasure of meeting her in person, and as we say here in the South, she is the REAL DEAL! My husband and I live in a small, country cottage in South Carolina that is about 100 years old. It was built by his grandfather, after whom he is named, and he grew up in this house. 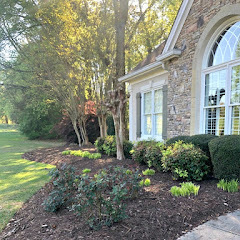 Five years ago, the house stood empty, and we decided to move into it as we were downsizing and simplifying our lives. My favorite room in this house is the living room which you step right into when you enter our home. It's my favorite room because it's filled with memories, sentimental gifts, and things we've collected over the years. And it was in this room that I first met Leo's big, boisterous family when they had all gathered to celebrate his father's 80th birthday 21 years ago. This room has a story to tell about our family and has been a haven for so many people, including us. So there's a real sense of history in this room and that's why I love it so. 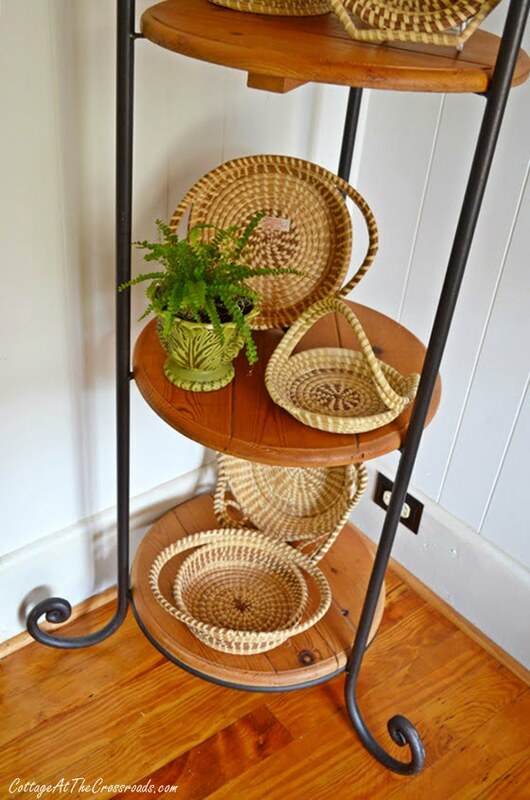 The first thing that you see when you enter this room is this corner piece that holds a collection of sweetgrass baskets. The baskets are indigenous to Mt. Pleasant, South Carolina and are a reminder of the many wonderful years when Leo and I lived there. We found the iron and pine piece at an antique store in Charleston. Most of the baskets werehandmade and given to me by parents of students that I taught in Mt. Pleasant. They are real treasures. 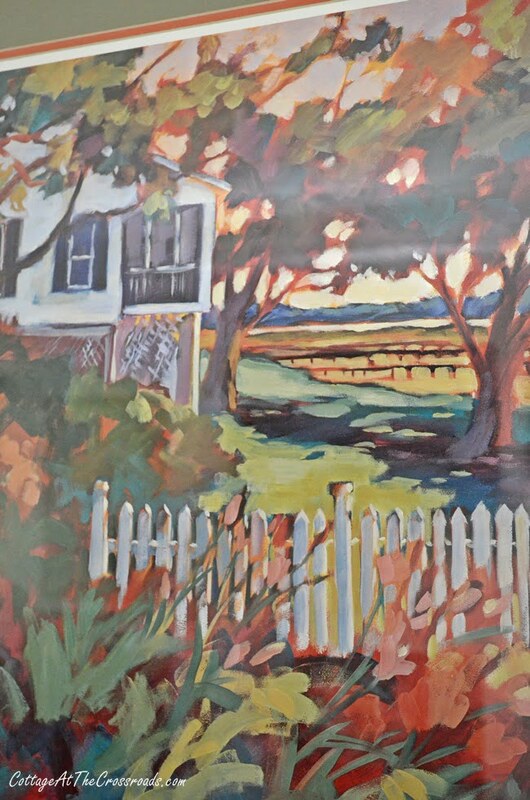 On the wall beside the sweetgrass baskets is a print by one of my favorite Lowcountry artists of a cottage on a marsh. I've always been drawn to cottages. 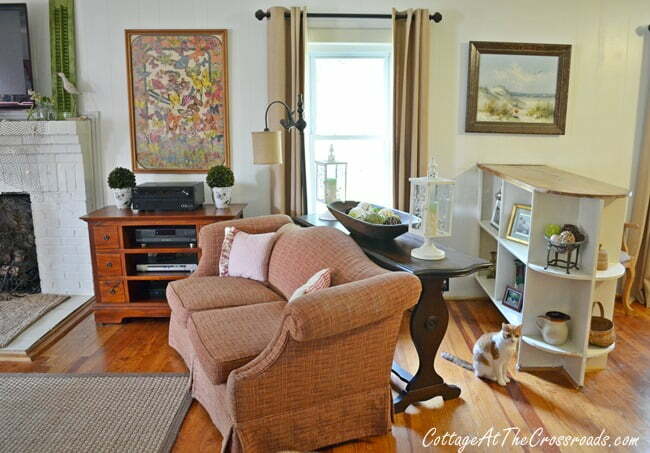 On the left is a red music cabinet that I painted last year and our sofa. When we first moved here, we pulled up the carpet and discovered these wonderful old pine floors. We had them refinished and painted the walls, ceiling, and fireplace white to better serve as a canvas for our colorful furnishings. The acoustical tile ceiling has been up in this room as long as Leo remembers and it absorbed 6 coats of paint! He thinks that there may be a beadboard ceiling above it, and we hope to one day pull down the tiles to expose it. Along one wall, there is a pine chest surrounded by our comfortable chairs and ottomans which is where you'll find us sitting most of the time. Leo remembers sitting in about this same spot when he watched the Beatles' first appearance on the Ed Sullivan Show as well as witnessing Jack Ruby shot and killed by Lee Harvey Oswald on live TV. If you're old enough to remember, that happened just a couple days after President John F. Kennedy was assassinated in Dallas. 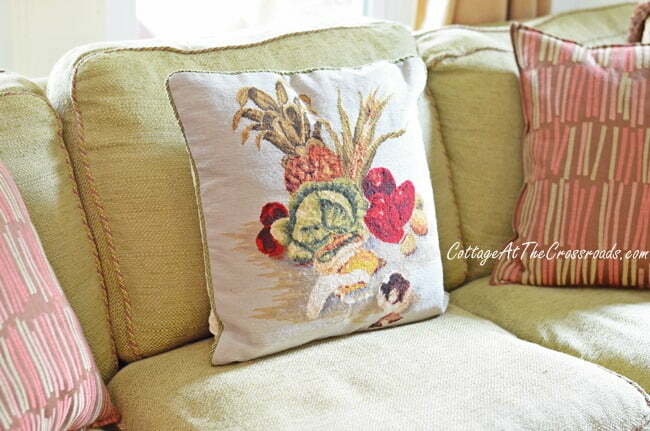 Here's a little closeup of one of my new pillows in my chair. Like Kim, I love pillows and ticking! This room contains a lot of art, and this one above the media cabinet is one that Leo's mother colored over 50 years ago. We found it in the storage building and moved it inside as a reminder of her. 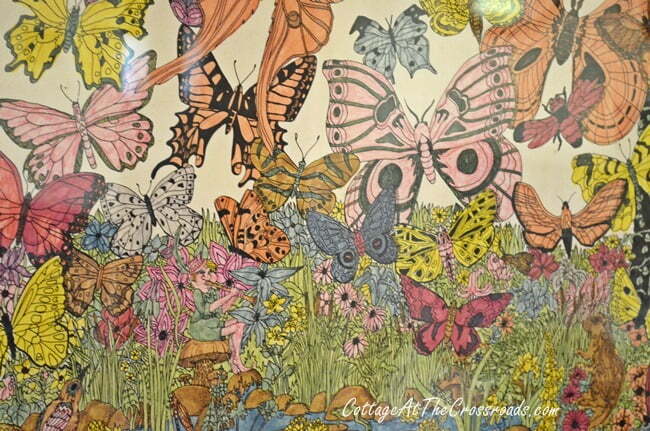 When you see it from a distance, it appears to be a tapestry but it was done with colored pencils and the colors have not faded over time. Leo remembers his mother completing it while she was recuperating from cancer treatments when he was a child. She did it all while sitting at the dining room table. 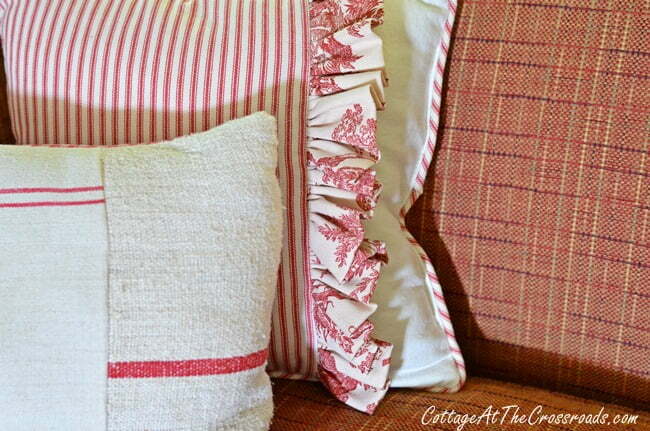 On the loveseat, there are more pillows in some of my favorite fabrics of ticking, toile, and grain sacks. 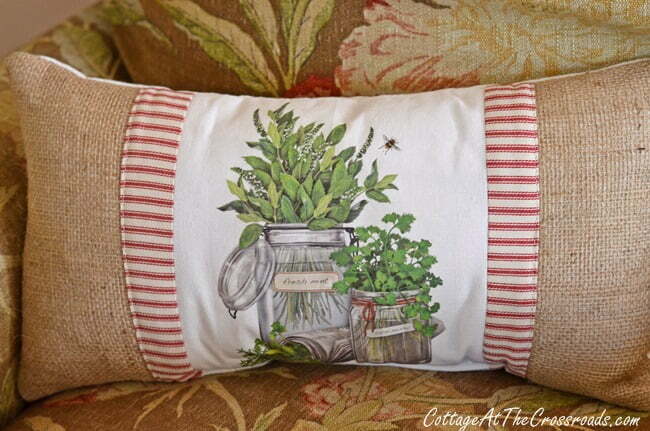 And speaking of pillows, this one on the sofa has vegetables on it and was my birthday gift from Leo last year because I love to garden. And the lamp on this round table was a gift from Leo years ago. I had seen it in an antique shop and he surprised me with it. I love the intricate detail on it. Above the chest is another favorite piece of art that we found in Georgetown, SC. I guess I've always been an admirer of English cottage gardens! 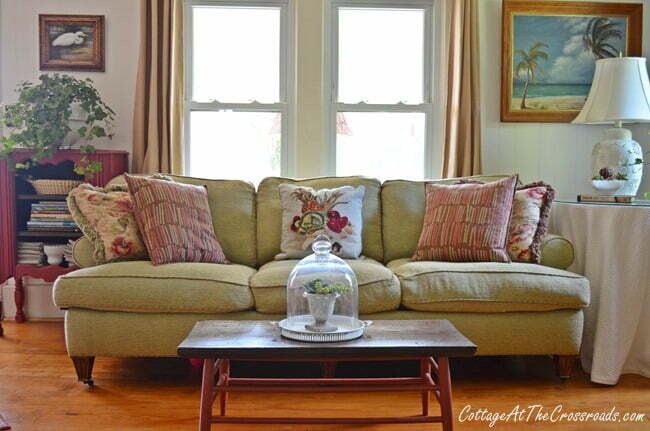 Behind the loveseat is a sofa table holding an antique dough bowl and some lanterns. The bowl was given to me by an elderly gentleman many years ago. He said that no one in his family wanted it but that he knew that I would keep it and treasure it. Each season I change out the display, and right now, it has a summer look. 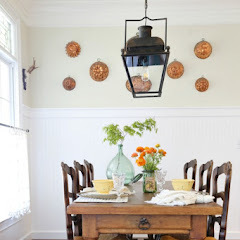 Some wooden dividers separate this part of the room from the dining room. We had some very similarly looking ones in the farm house I grew up in! 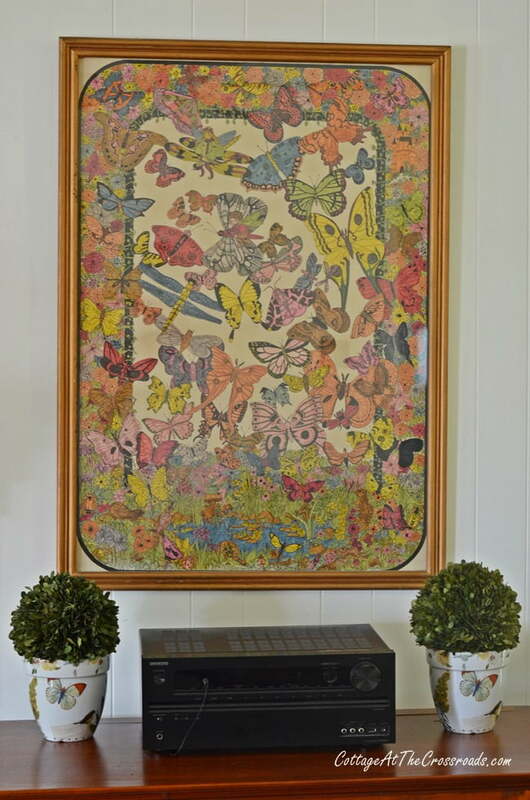 It a perfect place to display a variety of family photos, books, and collectibles. 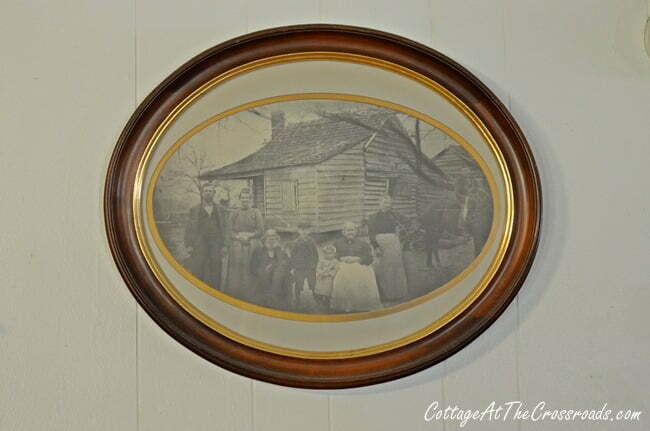 Above one divider is a photo of the old log cabin at Windhams Crossroads that dates back to the Civil War. On the left is Leo's grandfather who built this house along with his great-grandfather and other family members. I feel a real connection to the past by thinking about how many family members have sat in this very room over the years. Well, I might as well show you the dining room too because it's really all one room which is so unusual for homes built long ago. On top of the corner cabinet is a collection of jugs and old pottery. The table is set simply for a supper composed of mostly vegetables. That's what we've been eating all summer. 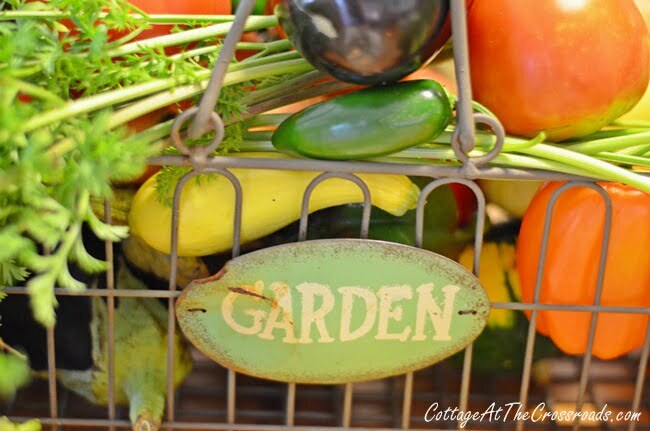 All of the vegetables in the basket were grown in our garden. One of the first things that we did after retiring and moving here was to start a vegetable garden. 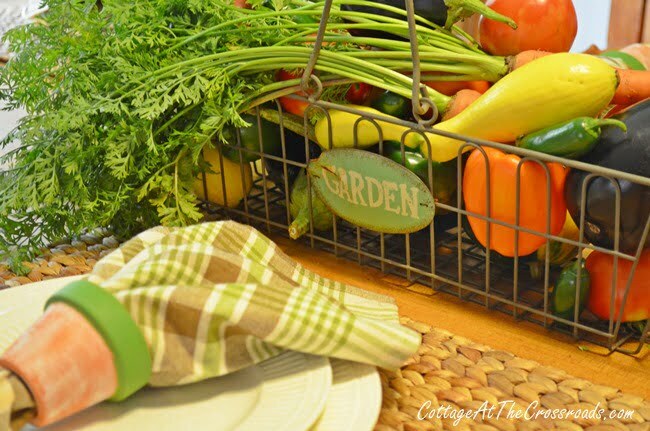 And we've become known as the People with the Vegetable Garden around here and in Blogland! It is in this chair that I sit and communicate with so many of you with Rascal perched on the back. Thank you, Kim, for inviting me here today to share my favorite room. Can you imagine how many stories could be told if only these walls could talk! Thank you Jane for opening up your home and letting us visit. 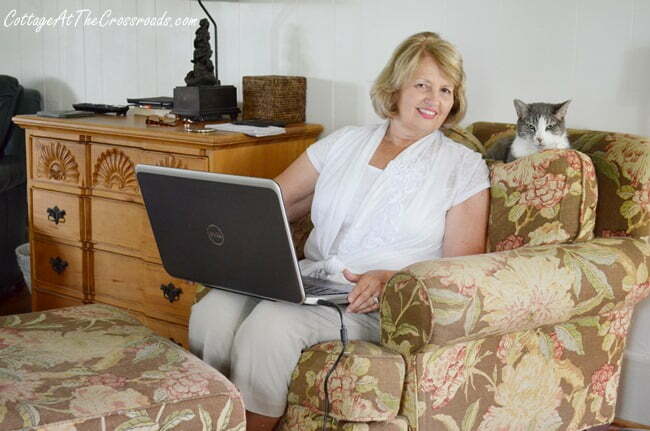 You and I both blog from the comfort of our chair in our favorite rooms. Doesn't get any better than that. 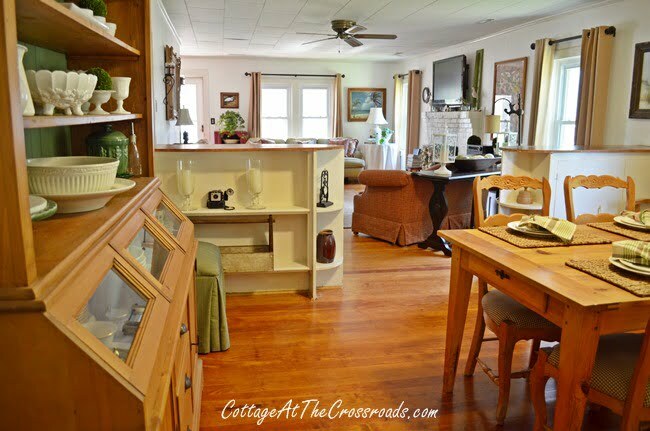 I hope y'all will hop over and say hi to Jane at Cottage at the Crossroads. So lovely and cozy. I really admire how so many things in the home are meaningful. Just lovely! Thanks for sharing.. I think I will go on over and visit with Jane,,. Blessings! I love your living room and dining room. They look so warm and welcoming. Thanks for sharing! Enjoyed your room so much, Jane. I would be so comfortable visiting! Beautiful room! 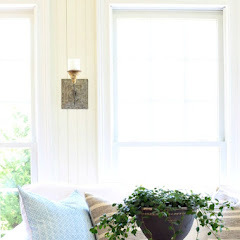 So nice to see you here Jane...you and Leo are some of my favorite people in blogland!...I love wonderful "family" home...how great to live in a home that was built by Leo's grandfather and you two have so lovingly cared for it. I love your living room filled with beautiful artwork that is truly sentimental...I would definitely not get passed the foyer from looking at your beautiful sweetgrass collection!...You and Leo must enjoy sitting in your favorite room surrounded by the treasures of family that you so love...and must say, how great of that friend to give you that dough bowl..he was right...you would treasure it and make sure it had a happy home! What a beautiful room, so rich and full of history. Hi Kimmie and thanks for allowing Jane to share with us! Her room is cozy and just filled with 'family'. Love your home ... so cozy. And Rascal definitely looks like a rascal. Thank you for the tour of a wonderful home, full of so many happy memories! Such a beautiful room Jane. So full of mean8ng and memories. 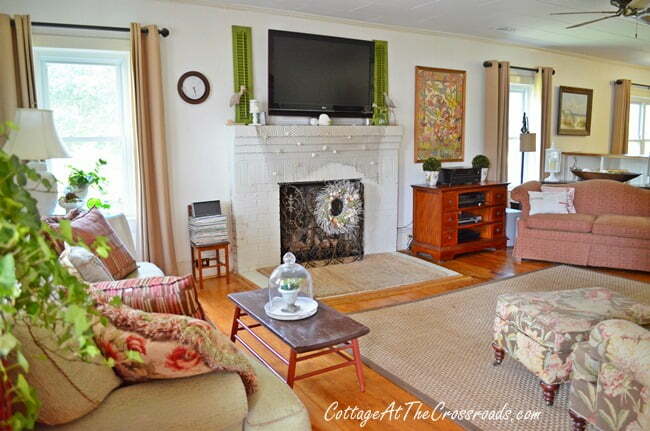 Jane and Leo have the most beautiful cottage! I just love it! I think it's so special that Leo remembers being there for the Beatles on Ed Sullivan! 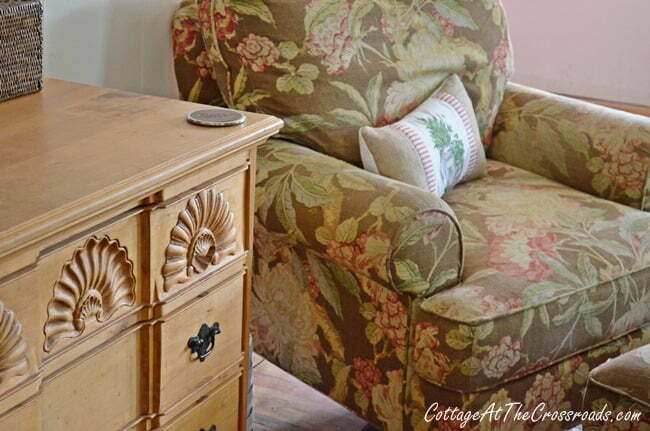 I love that so many items have such a special memory and meaning in this cottage.It's a treasure! Jane and Leo's cottage is one of my very favorites too! They are always so kind to others also. Love their blog. BEAUTIFUL Jane!! I loved every detail!! I enjoyed reading about Jane's favorite room and can understand why she loves it. 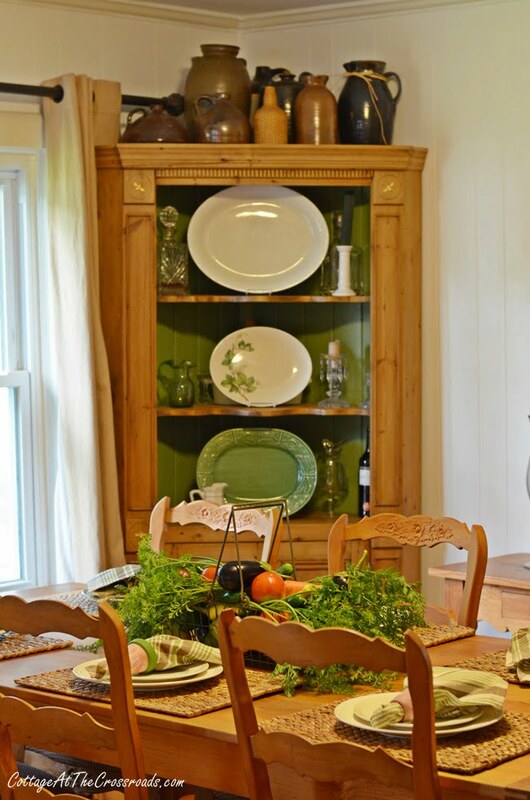 How fun to live in a home that has been in the family so long. Jane, you have a lovely home. It reminds me of my in-laws lake house.It used to belong to my husband's grandfather and my husband practically grew up there. So many memories. The whole front of the house is one big room. Living room, dining room and kitchen. Even the clothes washer used to be in there. I so desperately want to get my hands on it and redecorate it. Your place has given me so many ideas! 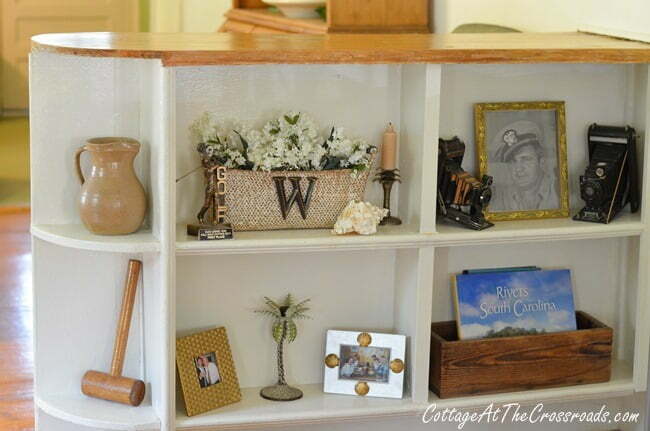 I love the wooden dividers and will definitely be using that idea. Kim, thank you again for sharing! 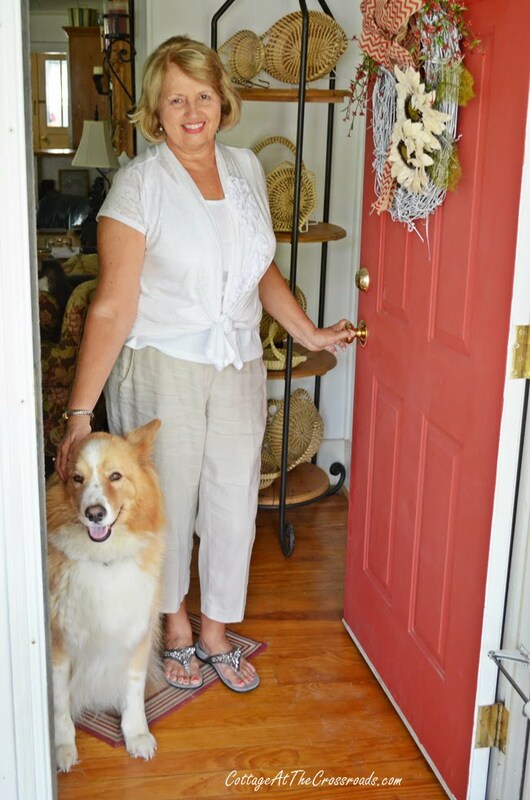 Jane, You are a charming and talented hostess sharing your favorite room with so many meaningful treasures and greeting us at the door. LOve the baskets that you displayed perfectly. Your room has so much personality and feels so comfortable. Seeing where you blog made this post special too. 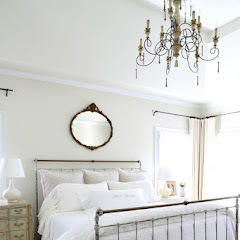 We do connect with blogging friends and seeing you in your delightful room was the crowning touch. I'm crazy about the fresh vegetables as your centerpiece. Love them. Love sweet Jane ... and, of course, their beautiful home! Always looks so warm and inviting ... great feature, indeed! 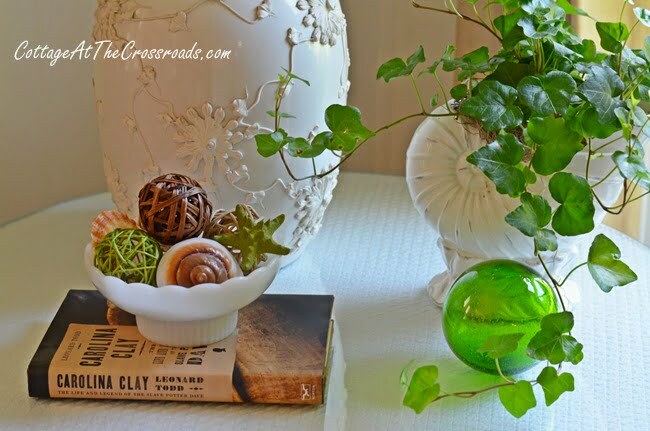 Jane has a lovely home filled with treasures and memories…thanks for sharing! Jane, your home is filled with such love and important personal treasures. Thank you for sharing with us!! 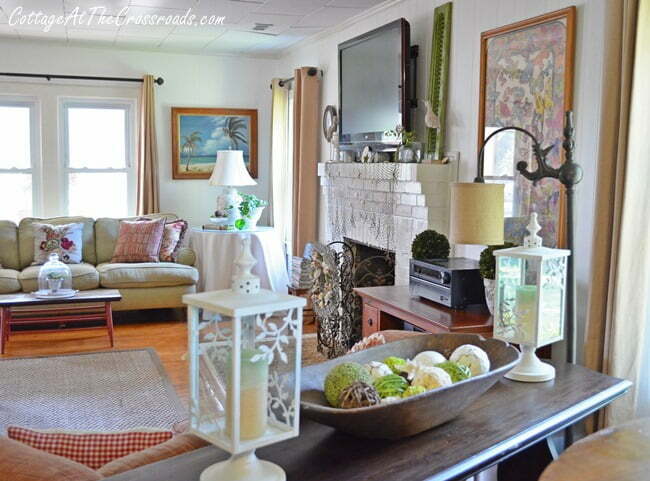 I love how light the room is and how you have it layered with lots of color. Thanks, Kim. 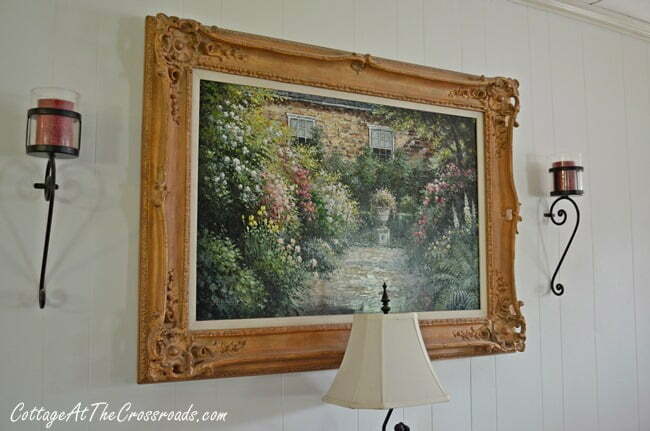 It's fun to see Jane's beautiful room filled with family treasures. 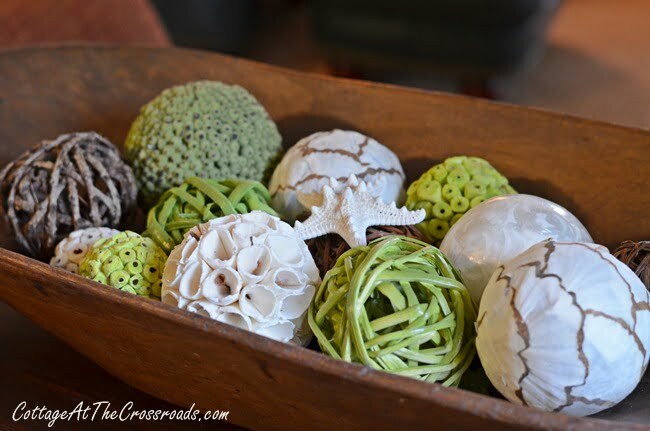 Her collection of sweetgrass baskets is truly special. Awww...I just love Jane and Leo and Kim too!!! All such wonderful folks! Thanks for the tour! Kim, thank you so much for having me over today to share my favorite room! I have enjoyed reading the sweet, sweet comments of everyone! Kim this is one great post! Great people, great home! 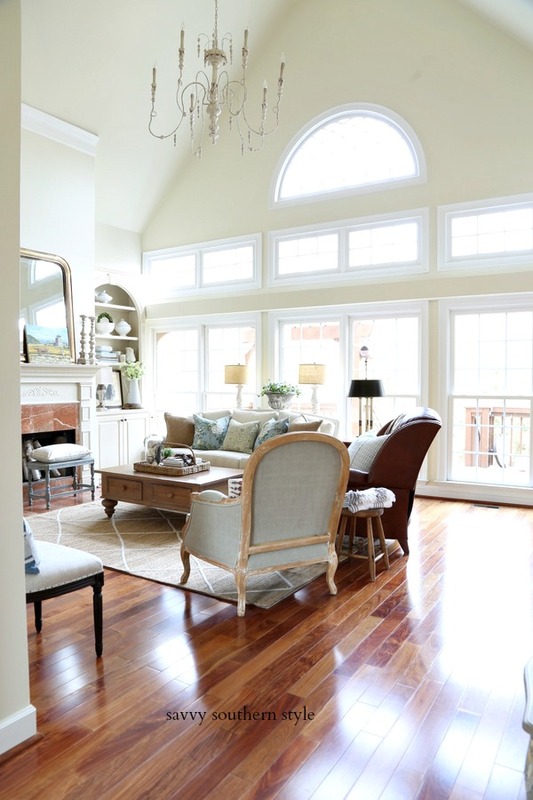 Such a pretty and classic home - and I love those fur babies! After your tour I think I like you more than your beautiful cottage!! What a lovely lady, YOU are. To love all the stories and the presence of the place is something I really treasure. Thank you for sharing it all with us. And I especially love Rascal on your chair. Kim, Thanks for sharing Jane and Leo's home. It has a lovely history and so many pretty and meaningful things. Love a house like that, and I'm LOVING their sweetgrass baskets. What treasures. Kim, I so enjoyed seeing Jane & Leo's home and hearing more of the history behind it! I always feel at home when I visit at The Cottage at the Crossroads! Wow, you weren't kidding when you said you were surrounded by history and memories in this room and the entire home. It is so pretty -- very charming and most welcoming!